Mount Hermon offers incredible one-of-a-kind adventures in the redwood forest – and tour programs are growing quickly! All our activities have been designed to be both fun and challenging, good for individuals and groups, and multi-generational. All our activities are run by expertly trained staff to ensure a safe and enjoyable experience; we love to see our guests building memories with friends and family. We invite you to explore how these options might enhance your retreat, engaging guests with God’s creation and each other. Your retreat coordinator can provide details about availability and pricing, and help you determine which options would be a good fit for your group. Below is an overview of our current options. Soar through our unique forest and experience the giant redwoods from 150 feet above the canyon floor. This is the ultimate shared experience as small groups are led through a two-hour experience of seven platforms, two sky-bridges and six zip lines of up to 440 feet in length. 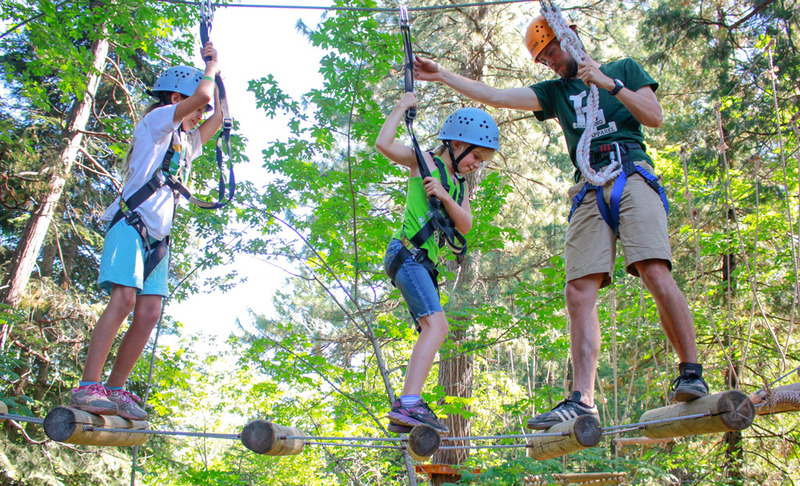 The Sequoia Adventure Course is our most popular ropes course with 14 different high course elements that range from 30 to 80 feet above ground. All participants wear a harness, helmet, and are connected to overhead cables with double safety lanyards. The course is supervised by our expert staff who coach and encourage each participant. Discovery Grove is the perfect experience for those who are new to ropes course activities and want to start a bit closer to the ground. The course consists of 7 different high ropes elements, from 5 to 20 feet above ground, and ends with a zip line. The course has been designed specifically for participants aged between 7-11 years old (older is OK). Team Building programs are an intentional way to transform the way your group approaches challenges, communicates, and works toward common goals. With years of experience, Mount Hermon facilitators will guide your group through low and high activities to bring your group together like never before. Mount Hermon Adventures will work with you to custom design an experience that will meet your goals. Our programs can focus on a variety of themes like effective leadership, creative thinking, appreciative inquiry, and group synergy. Provide an opportunity for your group to not only strengthen their climbing skills, but also give them the chance to encourage and coach each other as they climb. Give your group a special morning or afternoon outing to experience waves, the kelp gardens, and possibly even sea otters, seals, and dolphins. A peaceful trip to the ocean can be just what your group needs during their time away. Each tour is approximately 2.5 hours round trip. Practice perfection with our staff at the shooting range by challenging each other with accuracy or by improving your personal skills. Take advantage of the beautiful scenery located in and around Mount Hermon by participating in a mountain bike tour. Our guides will take you around camp as well as off campus through the beautiful redwood forests. Tours can be personalized for all types of fitness levels. Contact your event coordinator today to reserve these activities for your group to enjoy!